Your couples-only getaway destination is waiting. An all-inclusive resort that caters to your every desire. The resort is specifically designed for romance, so you can focus on each other while making lasting memories. From personalized service to romantic dinners on the beach, Sun Palace has everything you need for romance. A short 15 minutes from Cancun International Airport, Sun Palace boasts 252 well-appointed suites, each one with its own private balcony. Within the room you will find a welcome bottle of wine, purified water, Farouk® CHI bath amenities and cozy bathrobes and slippers. Plus, you can enjoy your vacation to the fullest with the $1,500 Resort Credit offer which you can apply to spa treatments, games of golf, and tours. You can wake up every morning to the sweet mist of the Caribbean Ocean while enjoying breakfast, which you can order at anytime of the day thanks to our convenient 24-hour room service. When you feel like venturing outside your room, you can head to the lobby area where you’ll find a delicious international buffet at El Aurora. You can also enjoy delicious Pan-Asian hors d’oeuvres at the Oriental Lounge located on the first floor. After breakfast, you can relax by the pool or sign up for any of the daily scheduled activities happening throughout the resort. Keep your workout routine by visiting the fully-equipped fitness center and after you’re finished toning those muscles, you can treat yourself to a relaxing spa session with one of their professionally trained staff. Whatever your style of vacation – They’ll be sure to meet your expectations. 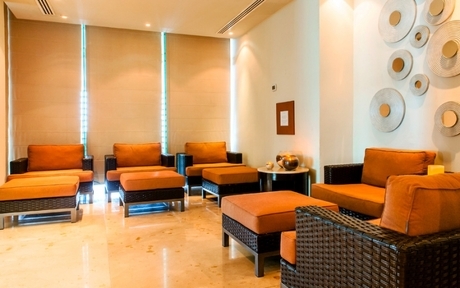 Sun Palace offers brand name spirits throughout the resorts and even in your room, all included. Whiskies: Jack Daniel, Johnnie Walker (red and black labels), Ballantine’s, and Chivas Regal. Vodkas: Grey Goose, Smirnoff, and Blat. Gins: Beefeater and Tanqueray. Brandies: Fundador, Presidente and Don Pedro. Rums: Bacardi, Havana Club. Tequila: Don Julio. All wines feature special qualities ranked by wine connoisseurs and critics that score 80 points or higher. 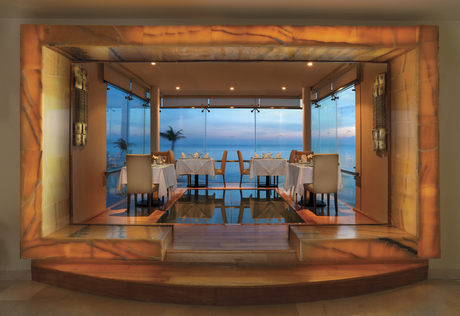 At Palace Resorts they offer a variety of world-class dining options. Using the best local and imported ingredients, they offer many cuisine choices including American, Mexican, Italian, Pan-Asian and more. Savory and sweet treats served with gourmet coffee, teas or the drink of your choice, always available throughout lounges and snack bars. A wide selection of options, including breakfast favorites, entrees and main courses, soups, salads, snacks and desserts, available 24 hours a day. Best of all, it's included! ALL INCLUSIVE FEATURES: Luxurious accomodations, fine dining, delicious snacks, top-shelf drinks, 24-hour room service, wireless Internet, unlimited long distance phone calls*, 30 minute Internet service when using resort’s computers, taxes & gratuity, sensational entertainment, non-motorized water sports * Within Mexico, to the Continental US and Canada through December. *Please Note: This is an adult couples- only resort. Adult minimum age is 18. 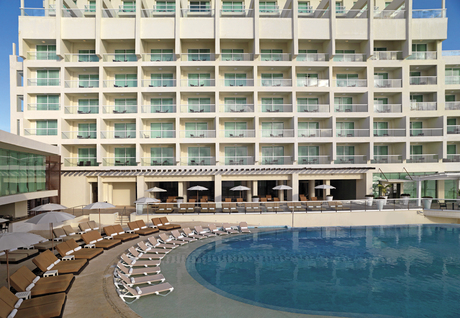 Sun Palace Resort is an amazing Cancun lodging choice for your trip to Mexico. 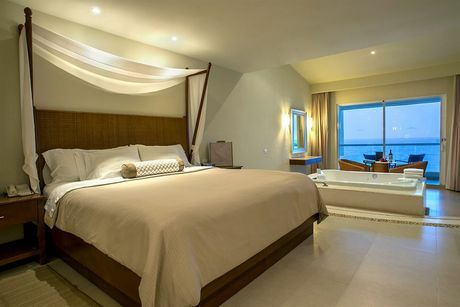 With numerous amenities for guests such as room service, car rental, free full breakfast buffet, you will wake up at Sun Palace Resort feeling refreshed every day for your time in Cancun. Don’t let this amazing reservation opportunity pass you by, book your stay at Sun Palace Resort today to make the most of your time in Cancun, Mexico.